Odd that I should pass the small band of faithful in Martin Place for ‘Occupy Sydney’ on my way to see The Hunter. Odd, because this film is an interesting take on the idea of a big faceless corporation hiring a hit-man to take care of some business. Only the victim in this case is not to be just one person but an entire species, and they don’t just want it dead, they want its DNA. Creepy, yes; and a great premise for a film. What a shame the script wasn’t better developed. The Hunter doesn’t disappoint entirely. A strong storyline and some very interesting relationships develop. Despite some unfortunate stereotypes there is some genuine complexity in the fabric of the film, but The Hunter lacks any real character development. Now, I’m all in favour of plot-driven stories, but the plot in this film doesn’t move fast enough to carry well without stronger characters. 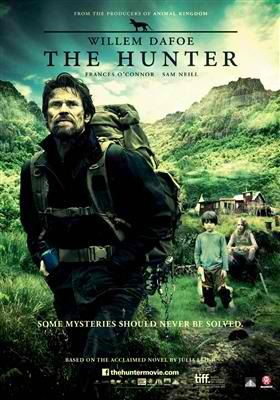 The hunter himself, played by Willem Defoe, is two-dimensional and lacks any back story to justify his quiet demeanour. By the time he reaches the climax, we still don’t really know him. The vaguely heroine-like Lucy Armstrong doesn’t quite make it to romantic lead, but despite the lack of script development, Frances O’Connor does a great job of bringing her to life. Apart from the very engaging children, played by Morgana Davies and Finn Woodlock, the rest of the cast are just plot devices. I still think there’s a lot to love about The Hunter. Tasmania’s wilderness is a landscape that was made to be a film set, much like Utah’s Monument Valley was, except the Tasmanian bush has mood swings. Really, what the characters lack is almost made up for by the bush, which certainly changes its mood more often than Willem Defoe does. I’m not just being flippant; the bush genuinely works for this film, and the cinematography is exceptional, which makes the poor script all that much more disappointing. This one’s not worthy of a cinema screen, but it’s worth seeing when it comes to TV. And I really did like it.